This is the latest release from Gypsy Knights Games having being released in the past week or so at Drivethru RPG. 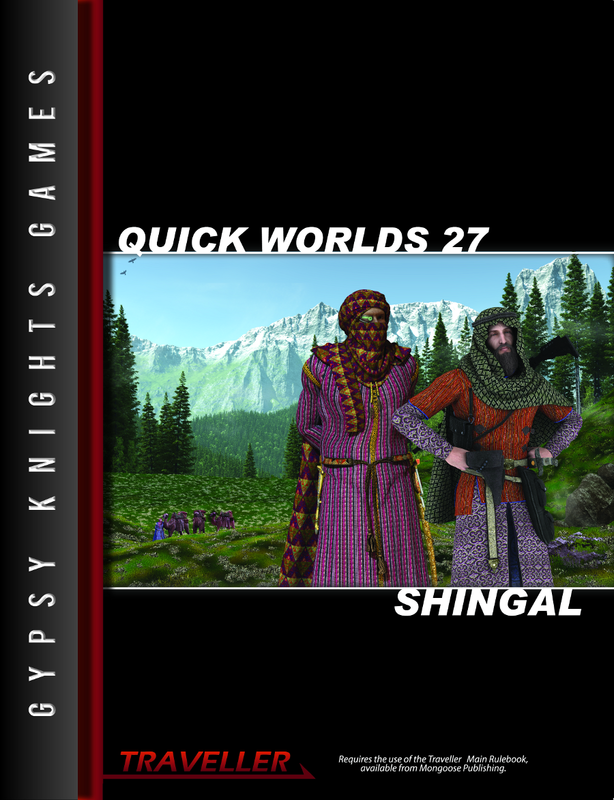 QW27: Shingal follows the same format as previous Quick Worlds releases in detailing the background of a single world within a planetary system. You can pick it up from Drivethru RPG for the same price as the last release (QW26: Winston) – $3.99. The background presented is heavily orientated towards the GKG Mongoose Traveller compatible ATU ‘Clement Sector’ but the book is perfectly usable in any other setting. The world was settled by the Yazidi’s in 2326 and currently there are over 35,000 people located in the single inhabited city, located not far from the original landing zone. The book described why the Yazidi’s left Earth search of a new world with quite a bit of cultural detail, describing the structure of the calendar and their religion. Access to Shingal is pretty restricted; you’ll need good reason to gain access to this world. Shingal is largely unexplored, the inhabitants have largely spent most of their time building and establishing their colony. The world itself is pretty temperate and there is the now-familiar hydrographic, geographic and atmospheric background listed. The last page contains referee’s only notes; there are some tantalising things about Shingal which I’m not going to reveal, but would form the basis of a few interesting adventures. I’m going to make a direct comparison against QW26: Winston as this is the most recent from the Quick Worlds series, I think Shingal offers an interesting and colourful diversion as it is based on the Yazidi people. The text flows nicely and aside from the cover and a few of system and planetary maps, there is no other artwork. However I felt it could have done with just one more page to flesh out the adventure ideas a bit more; the book is nicely balanced but I felt it was perhaps almost ‘cut short’ and just needed one more page to finish it off nicely – especially with the ‘hint’ of something special about Shingal. As it stands, it will need a bit more work from the referee to get the most out of the book for the basis of an adventure. I’d like to send my thanks to John Watts of Gypsy Knights Games for sending me a copy to review. This entry was posted in Classic Traveller, Mongoose Traveller, Traveller TNE and tagged Clement Sector, Gypsy Knights Games, Mongoose Traveller, Quick Worlds, Shingal, Winston. Bookmark the permalink.